The guy who robbed the BB&T on Fox Mill Road on Black Friday is at it again -- and if the security camera photo is any indication, he's been hitting the gym. 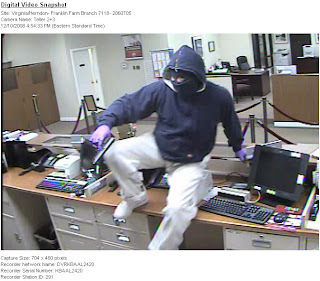 A 23-year-old woman, employed as a teller at the BB&T Bank located at 13360 Franklin Farm Road was robbed at gunpoint. On Wednesday, December 10 at around 5 p.m. a man vaulted the counter displaying a handgun. He confronted the teller and announced a robbery. An undisclosed amount of money was handed over and the suspect fled. There were no injuries. The suspect was described as having light skin, possibly black or Hispanic. He was about 5 feet 7 inches tall, with a stocky build. He was wearing a blue, hooded sweatshirt, khaki pants, white shoes and a black mask. Detectives have linked this suspect with the bank robbery that occurred at the BB&T Bank located at 2513 Fox Mill Road in Reston on December 1. Check out that leap! Police may want to be on the lookout for someone with a) an Olympic medal or b) a pommel horse in their garage.